Within days, Livia Locci, the public prosecutor for the Court of Turin in Italy, will decide on the merits of a complaint of defamation, lodged against three Italian journalists, by Isabel dos Santos, the firstborn daughter of the Angolan President José Eduardo dos Santos. As a citizen, Isabel dos Santos is, at all times, entitled to and ought to invoke the universal right to her honour and good name, wherever she is or feels unjustly treated. This right also extends to all citizens of Angola, who, by force of circumstances, have been governed by her father for the past 32 years. The present text deals only with the arguments presented by Isabel dos Santos to the Italian court which have a direct bearing on Angolan citizens, and which could be damaging to the country and the honour of the Angolan people. On July 15, 2007, the Italian newspaper, La Stampa, published an article by the journalist Giulia Vola, entitled La Dea Nera degli Intrighi (The Black Goddess of Intrigues), in which she refers to Isabel dos Santos as heading a vast private business empire including oil, diamonds and banking. According to the journalist, the assets managed by Isabel dos Santos derive from corrupt dealings and favouritism due to the fact that her father, José Eduardo dos Santos, is the Ppresident of Angola. At one point, the journalist alleges that the plaintiff is merely the figurehead of a business empire belonging to the actual Ppresident, a man known for his inability to distinguish between the good of the people and his own private interest. Her article also refers to the supposed collusion between the Angolan political and military class and international figures of questionable repute, including the Sicilian Mafioso, Victor Palazzolo, a fugitive from Italian justice. According to the newspaper, certain business ventures belonging to Victor Palazzolo, also known as Robert Von Palace-Kobaltschenko, have also intersected with those of Isabel dos Santos and some ranking generals in the diamond sector. Offended, Isabel dos Santos went to the Italian consulate in Luanda on October 2, 2007, to lodge a formal complaint against the journalist Giulia Vola, the director of the La Stampa newspaper, Giulio Anselmi, and the director of Wall Street Italia, Luca Ciarrocca, who also published the article. • On the accusation of presiding over an empire she stresses that “I am the daughter of President José Eduardo dos Santos and I do not manage any assets, much less a financial ‘empire’ belonging to the President, an “empire” which simply does not exist”. With regard to the arguments presented in her defence, Isabel dos Santos also includes the honour of the country, by stating that the text “is highly defamatory and prejudicial to my honour, my reputation, as well as to the reputation of my family and the Angolan state.” For this reason, her complaint extends to the honour of the Angolan people, who she also seeks to defend against falsehood. However, some of the statements made by Isabel dos Santos under oath need to be queried, otherwise Angolan society would give the impression of being abandoned to the falsehood of its leaders and their children. 1) The plaintiff unreservedly states that she is merely “the daughter of the president” and is not involved in the management of any assets. a) At the General Assembly of UNITEL, which took place on February 4, 2006, Isabel dos Santos was re-appointed to the post director of the executive board of the largest cell phone operator in the country. UNITEL is a private company with mixed capital, where the State holds 25 percent of the shares through Sonangol. To the present date, Isabel dos Santos retains her post as company director. The president of the General Assembly of UNITEL, General Leopoldino Fragoso do Nascimento, chaired the meeting. At the time, the general was the head of Communications of the President of the Republic, José Eduardo dos Santos. While the general retains his post as president of the General Assembly of UNITEL, he is also the chief advisor of the Military Bureau of the President of the Republic, and had Manuel Vicente, until recently CEO of Sonangol, as president of the Board of Directors of UNITEL. How did Isabel dos Santos get to be on the Board of Directors of UNITEL and where did she get the capital to become a shareholder in one of the largest private companies in Angola? The answers to this question would certainly go a long way towards helping the daughter of the Head of State to clear her name. b) Since 2005, Isabel dos Santos has been a director of Banco Bic, in which she holds 25 percent of the joint stock, according to legal documents dated from the June 7 2006. Her name, referred as member of the board of directors, has been regularly featured on the bank’s portal and on other documents as part of the company profiling. c) Isabel dos Santos’s involvement in the diamond trade in Angola is well known. On April 2, 1997, Isabel dos Santos, in partnership with her mother Tatiana Cergueevna Regan, set up the company Tais Limited, in Gibraltar. She held 75 percent of the shares and her mother the remaining shares. In turn, on October 11, 1999, the Angolan government, headed by her father, announced an agreement with her company, Trans Africa Investment Services (Tais), the Goldberg Group and Leviev Wellox, to establish a diamond trading joint-venture, Angola Selling Corporation Corporation (Ascorp), (Council of Ministers, 2003:1438-9; on the 5th of October 2004, Isabel dos Santos transferred all of her shares into her mother’s name and, by this time, Tais had changed its name to Iaxonh). The consortium’s approval amounted to a conflict of interest, nepotism and evidence of the crime of corruption “liable to impeachment of the President (Art. 127, 1, 2 of the Constitution)”. For additional information on Isabel dos Santos’s involvement in Ascorp and legal implications, see Marques, Rafael. 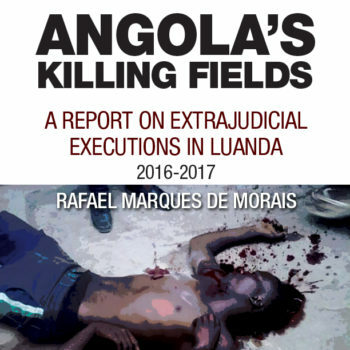 Diamantes de Sangue, Tinta-da-China: Lisbon, 2011:32-3.
d) The oil sector in Angola has been the most obscure and the one more closely controlled by the President of the Republic, in order to service his personal agenda. Final approval of any oil contract, whether by public tender or not, always depends on the President of the Republic. Decree 48/06 of the Council of Ministers, on the Procedures for Public Tenders in the Petroleum Sector, establishes that final approval for public tenders falls to the Government, i.e., exclusively to the President of the Republic, as the Head of Government (Art. 14, c). As an example, a year before Isabel dos Santos lodged her complaint, on the October 27, 2006, her father issued a permit for Sonangol to enter into a partnership with, among other companies, Prodoil, to undertake oil exploration in Block 1/06 (Decree 82/06). Prodoil is a company set up on November 9, 2001, by Marsanto, with the symbolic involvement of Prodiaman and Arlindo Fernando da Costa. Marsanto is a company created on December 17, 1996, by the niece and nephew of the President, Esmeralda and Edson dos Santos Sousa, children of his sister Marta dos Santos, as well as her consort José Pacavira Narciso. The latter, the Ppresident’s brother in law, has been the CEO of Prodoil since 2001. In reality, it is not possible to demonstrate how in this brief response how, over the course of his 32 year’s rule , whether through direct or indirect intervention, José Eduardo dos Santos has used his authority to create a business empire for his family of incalculable value. With regard to the political system in Angola, the declarations made by Isabel dos Santos collide with the truth and reflect a position opposite to the will of the Angolan people regarding the election of the President of the Republic. 2) From 1992 to 2010, the Constitutional Law enshrined a semi-presidential system of government. The statement by Isabel dos Santos, on the existence of a parliamentary system of government in Angola, made at the time she lodged her complaint, is simply false. a) José Eduardo dos Santos was never elected Ppresident of Angola, much less with a democratic mandate. The Constitutional Law Amendment of 1976 ( Law 71/76) established that “in the event of the death, resignation or permanent impediment of the President of the Republic, the Central Committee shall appoint one of its members to provisionally exercise the duty of President of the Republic” (Art. 33). The single party system was in effect, in which the MPLA legitimized itself as the only representative of the Angolan people (Art. 2 of the Constitution of 1975). In turn, in 1992, the candidate José Eduardo dos Santos was required to take part in a second election round against Jonas Savimbi, because he did not receive enough votes to be declared Ppresident in the first round. The second election round never took place. Therefore, the statement that José Eduardo dos Santos was ever legitimately elected President of the Republic of Angola is false. An individual who does not have a legitimate mandate and imposes himself against the will of an entire nation is a dictator, however skilful he may appear in giving an otherwise impression. Where contradiction and lies are concerned, father and daughter are certainly alike.